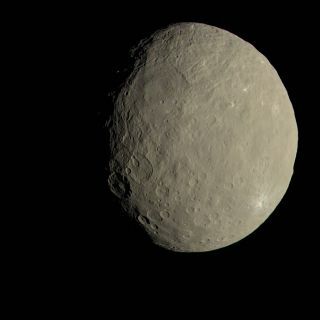 This view of Ceres from NASA's Dawn spacecraft shows what the dwarf planet would look like to the human eye. A new study suggests the rocky world's surface has wobbled in the past. Imagine Earth's north pole drifting as far south as Ireland — that is about how much the crust of the dwarf planet Ceres has wandered over the rest of that miniature world over time, a new study finds. With a diameter of about 585 miles (940 km), Ceres is by far the largest member of the asteroid belt located between Mars and Jupiter. Previous research suggests that Ceres might possess a frozen crust, an icy feature it has in common with a number of worlds in the solar system, such as Jupiter's moon Europa, Saturn's moon Titan, and fellow dwarf planet Pluto. The scientist discovered a number of anomalies that suggested Ceres experienced "true polar wander," which is when the entire solid outermost part of a world is able to drift over the rest of it because they experience different rates of spin. To envision this, imagine that a peach's skin became detached from the fruit's meat and pit and was free to move about over it. "I don't think it was speculated until now that Ceres experienced true polar wander," Tricarico told Space.com. One possible sign of true polar wander on Ceres is a giant ridge encircling the dwarf planet tilted at a 36-degree angle from the present equator. Tricarico suggested this may be where the equator of Ceres once was. "The shape of a body tends to bulge at its equator, which can stress the crust there and leave fractures, which is what we think we see," Tricarico said. This ridge and other anomalies on the surface of Ceres suggest that in the past, the dwarf planet's equator was tilted 36 degrees from where it lies now. In comparison, such a tilt is great enough to place Earth's north pole as far south as the spa town of Harrogate in northern England. Previous research suggested that several planets and moons in the solar system experienced true polar wander, including Earth and Mars. This reorienting may occur due to how mass is scattered across their exteriors and changes in their rates of spin — for example, prior work suggested Mars experienced true polar wander to move its massive Tharsis volcanic region to a more stable position nearer the Red Planet's equator. Ceres may also possess large differences in density across its crust, which potentially helped drive true polar wonder on it to help its exterior and interior experience similar rates of spin. In addition, if one looks at where the area marking the north pole of Ceres was and where that point is now, "the path it took does not look straight, but it followed an S-shaped path instead," Tricarico said. "It will be interesting to study why that was, and to connect that with the mechanism that triggered the true polar wander and what that all tells us about the interior dynamics of Ceres." Future research can also examine the potential causes of density anomalies on Ceres. One such anomaly seems located in a large crater on a dwarf planet, which might be the remnants of a plume of material rising from the mantle to the crust that lasted hundreds of millions of years, Tricarico said. Tricarico detailed his findings online Oct. 8 in the journal Nature Geoscience. Follow Charles Q. Choi on Twitter @cqchoi. Follow us @Spacedotcom, Facebook and Google+. Original story on Space.com.